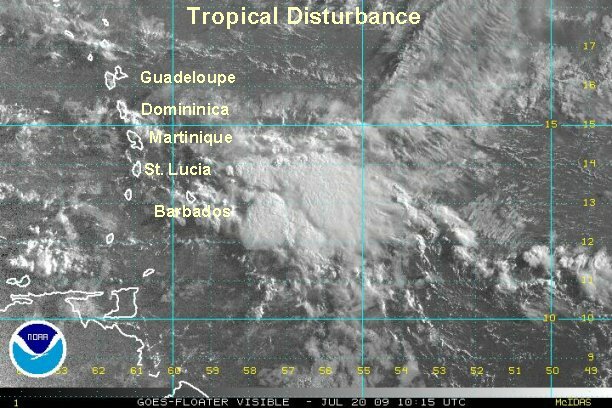 The sharp tropical wave is centered near 12.5° N / 52.5° W or about 575 miles east of the Windward islands. The wave is currently in somewhat favorable conditions, but westerlies are seen just to the west of the wave. This means that winds aloft should become more unfavorable for development soon. Forecast models show this trough lifting north in a few days, so if the wave can hold together there is some continued potential for development. Right now, we are simply keeping an eye out for further development. 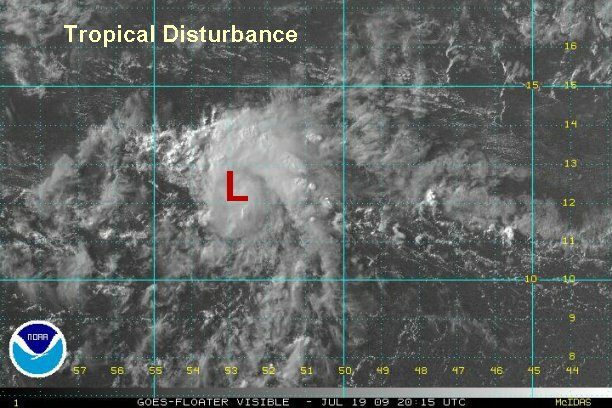 The "L" on the satellite image does not denote a tropical depression but center of the wave. Deep convection on the tropical wave is centered from 12-14° N / 55-59° W not far east of Barbados and parts of the of the Lesser Antilles. The wave has flared up again this morning after weakening last night. The Quickscat missed the wave again, so no good data on the surface wind field is available at this time. Once more visible images come in it should help us see if a surface low is forming. Heavy rain with flash flooding potential is possible as the wave moves through the Windwards and Leewards. At this time the heaviest precipitation is headed toward the northern windward's. Right now, we are simply keeping an eye out for further development. The tropical wave is now moving into the eastern Caribbean Sea with no more additional organization. The heaviest rain is moving through Martinique, St Lucia south through St. Vincent. Winds aloft continue to be unfavorable for development. The wave has moved into the central Caribbean this morning. 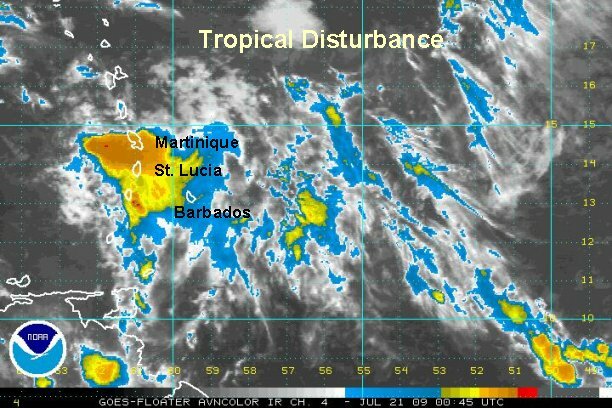 Showers and storms associated with the tropical wave remain disorganized. This will be the last update on this wave unless development conditions change.